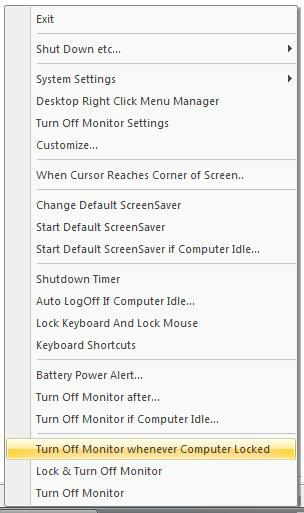 Download Free Trial of Turn Off Monitor Utility. Register Now (using PayPal Acount or Credit / Debit Card (without PayPal Account)) for instant full version download of Turn Off Monitor Utility by paying in $5.00 only and turn off or standby Notebook, Laptop or Desktop Monitor manually and get Software Utilities from this website free of cost. In case your current configured ScreenSaver does not work at designated idle time, then it may be that some application generates User Input due to which Computer does not remain idle and configured ScreenSaver does not work. Desktop Clock, Alarm Clock and more software downloads at Turn Off Laptop Monitor Home.